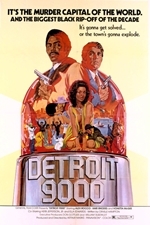 Detroit 9000 is a 1973 American cult film directed by Arthur Marks from a screenplay by Orville H. Hampton. Originally marketed as a blaxploitation film, it had a resurgence on video 25 years later. Street-smart white detective Danny Bassett (Alex Rocco) teams with educated black detective Sgt. Jesse Williams (Hari Rhodes) to investigate a theft of $400,000 at a fund-raiser for Representative Aubrey Hale Clayton (Rudy Challenger). Championed by Quentin Tarantino, the film was given a limited re-release theatrically by his short-lived Rolling Thunder Pictures distribution company in October 1998. It was subsequently released on video by Miramax in April 1999.